This exchange of drugs for luxury goods brought together the Thais and the Americans to a degree greater than any official duty ever did. When asked to recall their interactions with Americans and other farang in Bearcat Camp, the Thai veterans brought up their meetings with drug-prowling GIs more often than they did any other circumstance. Even those Thai soldiers who said they did not participate in these illicit exchanges often cited conversations with drug-using farang as the only time they had a lengthy conversation with a foreign soldier in South Vietnam. In addition to ... items ... available from the PX or the quartermaster's store, there were other items more difficult to obtain that the Thais eagerly sought from the Americans. Namely, they wanted guns. It was common for Thai soldiers to bargain for a sidearm like those carried by American helicopter pilots. Possession of one of these high-powered pistols, which were not included in the arsenal issued to the Thai units, brought honor to its owner. More importantly, these unofficial weapons would not be taken from the Thai volunteers when they returned to Thailand. They could be hidden in their duffel bags and smuggled past the military police and customs officials who haphazardly searched the returning soldiers. The most prized of these pistols was an American officer's .45-caliber Colt automatic, what the Thais called the "US Army brand," the "11" (for "11 millimeter," the size of its round, or "M1911," the US Army's designation for the pistol). They did not come cheap, though. To obtain a weapon like that, the Thai volunteers had to trade a minimum of three kilograms of marijuana. "They brought [the pistol] back to Thailand to show it off," Wad Kaeokalong explained. "Thai soldiers like guns." For an American intent on scoring some marijuana from a gun-loving Thai, it was only a matter of reporting that his sidearm had been accidentally lost in flight. Of all the stories about Thais who smuggled US Army weapons back to Thailand, one in particular gained legendary status among members of the Royal Thai Army for its audacity and high profile. Lieutenant General Chalad Hiranyasiri, the Thai commander entrusted by MACV to crack down on the Thai malfeasance in 1969, "embezzled" (om) a US Army helicopter as a "souvenir" of his time in South Vietnam. He kept it on the grounds of the Royal Thai Army's First Infantry Regiment. Chalad, who was described by one Thai military writer as "bighearted," used the helicopter to give rides to children each year on Children's Day. Nearly three decades after Chalad was executed for his coup attempt, the helicopter was still in use. After so much talk of famine, we too need some relief. Let us turn next to the food that travelers ate at the fifty-three stops of the Tōkaidō highway. In 1817 Yamagata Heiemon Shigeyoshi, the master of the scholar Yamagata Bantō (1748–1821), was summoned by the lord of Sendai. Yamagata left Osaka by boat on the eighteenth day of the first month and then traveled on highways to arrive in Sendai on the twelfth day of the second month. In his detailed travel diary, he recorded exactly what he ate at each of the inns at which he lodged. For lunch on the nineteenth, while looking out over Lake Biwa near Atsuta, Yamagata ate corbicula soup; a dish of carrots, burdock, and kelp; and a dish of trefoil dressed with white sesame sauce. Toward evening he arrived at Kusatsu in snowy weather; here it was so cold that even the lamp oil froze. Supper consisted of a vinegared dish (namasu) of giant white radish (daikon), persimmon, and greens; a soup of greens and dried bean curds; a hira of kamaboko, gourd shavings (kanpyō), and burdock; and a broiled salted mackerel. The next morning he ate white beet soup; a hira of Japanese cabbage (mizuna), shiitake mushroom, and dried bean curd; a choku of pickled salted plums; and a roasted dried fish. Yamagata crossed Suzuka Pass in heavy snow and spent the night at the bottom of the opposite slope: the twenty-first found him in Kuwana; the twenty-second, in Miya. Although the surroundings changed considerably, food on the Tōkaidō highway stayed basically the same at every inn. As soups, hira, tsubo, or broiled fish were not varied by introducing locally available specialties, the cuisine was quite monotonous. This was an official trip. Travel expenses for Yamagata and his attendant, a doctor, five porters, three packhorse drivers, and three horses were probably paid by the lord of Sendai. Thus meals at each post town must have been of a high quality. Although one must take into account that Yamagata's journey took place in the middle of winter, the lack of variety in the cuisine is surprising. Soups always included giant white radish, either fresh or dried; the hira always featured combinations of dried gourd shavings (kanpyō), tofu, burdock, carrot, potato, kelp, shiitake mushrooms, and, as recorded on a few occasions, dried laver (nori) and kamaboko. The tsubo consisted of kokushō; of tofu boiled in water, soy sauce, and sake; of burdock; or of light wheat gluten cakes. Broiled fish usually meant mackerel, young sea bream, sole, or yellowtail. Exceptional meals included the eel served for supper at an inn at Arai and the "fluffy eggs" eaten for breakfast at Fukuroi. Today Japanese travelers would tire of such fare in two or three days. Such cuisine gives us yet another insight into conditions on the Tōkaidō during an age in which the pace of life was much slower than it is today. Once Yamagata had passed Edo and headed for the northeast, some local color appears in his meals. At Kasukabe broiled carp (funa) was served; at Odawara he ate a wild duck. Broiled fish was almost invariably salmon or gurnard (kanagashira), but at Koshigawa he received dried cod flavored with sake. Nevertheless, both soups and hira featured nothing out of the ordinary. Even the fact that udo (probably yamaudo) was eaten at the stay at Kasukabe on the fifth day of the second month seems remarkable in this context. If high-class inns on the Tōkaidō and Ōshū-kaidō served this kind of fare during the late Edo period, one may assume that both the quality and preparation of food at townsmen's homes must have been quite mediocre by today's standards. NOTES: Although I was familiar with kinpira (金平 lit. 'gold ordinary'), I wasn't aware that hira (平 'level, plain, common'?) could be used for all types of similarly prepared (sauteed then simmered together) vegetable dishes. Perhaps tsubo (壷) 'pot, jar' dishes differ from nabemono (鍋物 'hot pot') by being prepared in the kitchen rather than at the dining table. Kokushō (濃く漿, 'thick sap/serum/plasma'?) seems more commonly known as 重湯 omoyu (lit. 'heavy hotwater') 'thin rice gruel', like okayu (お粥) 'rice gruel, jook, congee'. During the early years of the Edo period, Japan engaged in much trade with East Asian countries. As a result, a remarkable amount of foreign cuisine was imported. Unusual ingredients, previously seen but rarely in Japan, were introduced. Their use was at first limited to social or ceremonial events and special banquets, but in time they were consumed by a broad range of the population. A number of new foods are recorded in contemporary writings: red-and-white hanpen (a cake of pounded fish); yaki-dōfu (broiled bean curd); sarasa-jiru (a soup made with fresh chrysanthemums); a Javanese dish called gōren ("goreng") made with fried fish; and furugasuteru ("frikadel"), a dish apparently of Dutch provenance in which beef and cabbage were finely minced, combined with egg, seasoned with wine, covered with bread crumbs, and fried. The spread of such cuisine brings to mind my own experiences as a child. My hometown was in the Kansai area, in a rural area around the city of Akō in Harima. Things may have changed now, but in my childhood we called a dining table a shippoku-dai. Usually everyone ate from individual boxlike trays, but local tradition required the use of a shippoku-dai when guests arrived. The word shippoku, which originates from the Chinese word zhuofu (tablecloth [桌布]), denotes a Chinese-style dining table. But what we called shippoku-dai was a purely Japanese-style table with no hint of Chinese influence. Shippoku cuisine, a Japanese version of Chinese food, is today a specialty of Nagasaki; this cuisine and the shippoku-dai were probably transmitted to Japan in much the same manner. Although shippoku cuisine did not spread to the rural areas, the shippoku-dai, by contrast, spread to every nook and cranny of the Japanese countryside. Many people of the Kansai area must have fond recollections of this kind of table. Nigiri-zushi was also sold by "Atakematsu" of Atakegura in Honjo; eventually this sushi came to be known simply as "Matsu's sushi." ... Most were mere street stalls, but true restaurants existed as well. At any rate, sushi was highly popular. From Edo the sushi fashion spread to the Kamigata area. In the late 1820s a restaurant called "Matsu no sushi" appeared south of Ebisubashi in Osaka. This was the first Osaka outlet of Edo sushi: but before long this specialty was sold at shops throughout Osaka. Kohada （小鰭） and shinko （新子） are young and younger stages of konoshiro 'dotted gizzard shad', Konosirus punctatus (Temminck & Schlegel, 1846), according to Japanese Wikipedia, but a species utterly missing from English Wikipedia, where gizzard shad is summarily redirected to American gizzard shad (Dorosoma cepedianum), in a genus limited to eastern North America. The other five genera of the subfamily Dorosomatinae (gizzard shads) are not covered at all. The systematics of shads appear to be extremely complex. I first heard of shad from my youngest uncle, who had a cabin down by the James River near the site of Virginia's peculiar political gathering, the Shad Planking. Thai language skills seem to have spread quickly to areas beyond the villages directly surrounding Bearcat Camp. Infantrymen on operations were surprised to find Vietnamese women in isolated villages who could speak some Thai. Yutthasak Monithet, who went to Vietnam with the Black Panther Division's third phase in July 1970, recalled conducting impromptu Thai lessons for curious Vietnamese: "As for the Bien Hoa market. people in the shops could speak Thai, but they spoke it as if they had [recently] learned Thai. Sometimes they had questions [about Thai], and they would ask, 'What is this thing called in Thai?' We would tell them the words that Thai people used for these things." The market that Yutthasak described is fifteen miles or so from Bearcat Camp. The other factor that contributed to the spread of Thai was the influence of ethnic Vietnamese who had lived in Thailand and Laos. There is strong anecdotal evidence to suggest that some of the Vietnamese refugees who had lived in Thailand in the 1940s, 1950s, and 1960s returned to Long Thanh District and settled in areas near Bearcat Camp; others found their way to Saigon, Vung Tau, and other R & R towns frequented by Thai troops. Some of the repatriated Vietnamese opened Thai restaurants while others provided Mekhong whiskey and other goods to sell to the Thai soldiers. Many spoke the Isan-Lao dialect, "as they do in Ubon [Ratchathani] and Nong Khai, and others spoke Central Thai, also known as Standard Thai. A third factor was the role of the Thai-Vietnamese translators. Some of the Vietnamese who were hired to translate for the Thai units had lived in Bangkok before the war. Unlike the Vietnamese who settled in Isan, these Vietnamese learned Central Thai, the country's official dialect. They lacked Thai citizenship and apparently had been repatriated along with the Vietnamese from the northeast. Their familiarity with Vietnamese and Standard Thai made them a valuable asset to the Royal Thai Army and the Royal Thai Navy as they sought translators for their units. Mixed in among the population of Vietnamese returnees were Thai women who had married Vietnamese men back in Thailand and then accompanied them to Vietnam when the Thai government had deported them. Like the returnees among whom they lived, these women served as mediators between the two cultures. The Chinese characters for Viet Kieu must be 越僑: 越 as in 越南 Yuènán 'Vietnam'; 僑 as in 华侨/華僑 Huáqiáo 'Chinese Abroad'. The Thai soldiers saw South Vietnam as a separate country in a conception that differed from their understanding of their immediate neighbors Laos and Cambodia. Many of these soldiers had passed through those two countries in their youth. Private First Class Aran's childhood home in Nong Khai, for instance, was within sight of the Mekong River and the banks of Laos opposite. As he recalled, "It was like going into my sibling country. Back then Thailand and Laos weren't that different from each other. There was no ideology [separating them] at all. We crossed over to play like normal. We could eat and sleep, and then cross back. [The Lao people] were like our relatives; we could go back and forth [between Thailand and Laos] all the time." Those soldiers from the southern Isan subregion, many of them from districts where Khmer was spoken as a first language, enjoyed similar ease in crossing the Thai-Cambodian border in the period before the World Court awarded full ownership of Prasat Khao Phra Wihan (Preah Vihear in Khmer) to Phnom Penh in 1962. For the ethnic Khmer living in southern Isan's Sisaket, Surin, and Buriram provinces, a jaunt into Cambodia was as unremarkable as the boat ride on the Mekong River made by their ethnic Lao counterparts in the north. Vietnam was different. Its cultural dissimilarities more so than its geographic distance put it into a separate category. It seemed Chinese. The strong cultural similarities between the Vietnamese and the Chinese made such comparisons inevitable. The historical Vietnamese embrace of Confucian principles, Mahayana Buddhism, Chinese script (as well as Nom, the Vietnamese indigenous script that resembles Chinese to many outsiders), and the classics of Chinese literature encouraged the Thais to see Vietnam as belonging to China's sphere. It seemed distant beyond the kilometers that separated it from Thailand. Upon their arrival in Vietnam, the first action undertaken by many Thai volunteers was to acknowledge the presence and sovereignty of the local spiritual regime. As soon as Sergeant Khamron set foot in South Vietnam, he dropped to his knees, scooped up a handful of dirt, and sprinkled it over his head. He carried out this impromptu gesture to ensure that Mae Thorani would protect him while he was in South Vietnam.... "If you are Buddhist, they train you to do things like this," he explained. "There is a khata [verse] that says, 'When you go to a foreign land/Entrust your care to Mother Earth.' It is the same thing when you return. When I got back [to Thailand], I immediately knelt down, took up some dirt, and sprinkled it on my head. I said, 'I'm back.'" Khamron's decision to carry out the same action on returning to his homeland underscores the degree to which many soldiers saw South Vietnam's spiritual forces as belonging to a separate (and specifically Vietnamese) realm. Despite sharing the same physical landmass and duplicating the same flora, fauna, and weather, the two countries were seen to harbor individual and esoteric spiritual actors. The sovereignty of each area belonged to local spirits. For this reason, some Thai soldiers brought their own soil with them. They collected samples of dirt, which they addressed as "Mae Thorani," and carried the samples with them to South Vietnam. Behind the confident statements issued by Thai and US leaders throughout the first half of 1967, the battle readiness of the regiment was uncertain. American military personnel who had come to train the Thai [Queen's Cobra] regiment were unimpressed by the volunteers' level of preparedness. From early June, in the ten weeks that remained before embarkation, the American advisers guided the Thai unit through field exercises and training missions in Lopburi, Chonburi, and Kanchanaburi. The Americans had designed "an intense training" program that "drilled the Thai [troops] in the exact tactics and methods of operation employed by the Viet Cong." They hoped that this crash course would help the Thais counter the guerrilla warfare methods being used by the Vietnamese guerrillas. All of the American instructors came from experienced combat units in South Vietnam and were eager to impart the lessons they had acquired. They attempted to simulate the conditions that the Thais would face in South Vietnam, but despite the physical similarities between Thailand's and South Vietnam's landscapes, the Americans found it difficult to impose a sense of urgency or even realism on the regiment that had hitherto been regarded as a domestic symbol. In Kanchanaburi the Americans led the Thai troops in field training exercises that crisscrossed the jungles along the Khwae (or Kwai) River, not far from the site of the bridge built by forced labor for the Japanese Imperial Army's "Death Railway" during World War II. The fictionalized retelling of the bridge's construction, as presented in Pierre Boulle's 1954 novel and its 1957 film adaptation, was on the minds of the Americans as they trained the Thai troops. The hint of cinematic make-believe suggested by the Khwae River location may have contributed to the growing unease among the American instructors. It was as if their appreciation of the book and film undermined their own attempts at simulating realism in the jungles there. The Americans' effort to impose realistic conditions on the exercises were compromised by the feeling that they had been dropped into a movie set on which a familiar, unrealistic film had been made. While the Thai troops were certainly aware of the cinematic resonance that the Khwae River setting elicited, the region offered them another set of specifically Thai symbols born from a different semifictional source: Thailand's nationalist history. The area used in the training exercises was not far from several sites important to the historical imagination shared by most Thai soldiers in this era. Kanchanaburi's location below the Three Pagoda Pass put it on a major route traditionally used by the Burmese and Siamese armies while invading and raiding each other's kingdoms. In the nationalist version of Thailand's history prevalent in 1967, a retelling of events that was particularly popular with members of the Thai military, the Burmese of old were always portrayed as the Thai people's archenemy. The natural corridor created by the mountains to the west and the Chaophraya floodplain to the east was the site of several celebrated (and historically embellished) clashes between these occasionally bitter rival kingdoms. The battle of Nong Sarai was certainly on the minds of the Thai volunteer soldiers as they trained for their South Vietnam mission. It had occurred during a phase of Ayutthaya's history when the kingdom's Thai rulers were struggling to retain their sovereignty after several decades of Burmese military occupation. At this site in January 1593, King Naresuan the Great, the most revered figure in this nationalist history, won Siam's greatest military victory. With his forces pressed to the breaking point, Naresuan was said to have called out the Burmese crown prince to challenge him to a duel on war elephants. After a few minutes of fierce combat, Naresuan got the better of his Burmese rival and killed him with a well-aimed slash of his sword. The Burmese forces panicked and fled south-southwest toward Burma. Naresuan's army pursued them through Kanchanaburi, decimating their scattered lines. In the midst of this atmosphere of competing cultural and historical symbolism, the Thai troops added one realistic detail to their training procedure that may have trumped even the Americans' passion for realism. The Thai troops carried live ammunition along with the simulated rounds used in their training because they felt they required protection against the dangerous forces that inhabited the Thailand-Burma frontier, everything from cobras and tigers to opium smugglers. Although the American trainers felt that the Thais did not fully comprehend the danger posed by the Viet Cong guerrillas, they were flabbergasted to discover how anxious this apparently sleepy western province made the volunteers. Normally, I try not to excerpt from books hot off the press unless they offer new historical perspectives on recent events. This ground-breaking book seems long, long overdue, and the rest of the chapter from which I've quoted is available online. It offers a useful corrective to those who view every regional conflict through the lens of their own far-removed national partisanship, those who see every wartime ally of a hegemonic power as a bought-and-paid-for puppet, or those who imagine that Buddhists cannot be just as warlike as members of any other religion. The most important of the Thai national symbols constructed during the war was that of the volunteer soldier. He was an idealized man who was brave, devout, patriotic, and selfless. His image was the incarnation of modern Thainess in an age of anticommunist furor. For a while, he would be hailed—in Thailand at least—as what was intrinsically good about the Thai nation in the postcolonial age. He would restore honor to the Thai military in the wake of its ignoble adventures during World War II, and make the goals of the military appear consistent with those of the civilian population. In the years before 1973–1976, when this idealized soldier-citizen was put to sinister use by the Thai military and by the Thai paramilitary vigilante organizations that emerged from the military's dark shadows, he was someone to be admired, envied, and supported. As symbols, the Thai volunteer soldiers reflected the evolution of Thai society in several critical ways. They stood at the nexus of many of the important themes that defined Thailand's history in the 1960s. In this way they can be read as the embodiment of the changes that affected the country after World War II. These trends are related principally to Thailand's relationship with the United States. In the period now known as the American Era, these troops became Thailand's official representatives in the biggest US-dominated event: the war against communism in South Vietnam. They were physical reminders of America's close relationship with Thailand during the period of the conflict. They wore American uniforms, carried American weapons, and conducted military operations according to American training. They departed and returned to Thailand aboard American ships and planes. They lived in an American-built camp bearing an American name. They carried American currency with which they purchased items of American material culture. The stories they carried back were as much about things American as they were about the people and culture of South Vietnam. Their repatriated casualties received prominent American visitors—some of them international superstars—in Thai military hospitals. And some of their dead ended up buried in American soil to be mourned far from home by American strangers. In an age defined by an American idiom, they bore the marks of close contact with the Americans. The troops were also a product of the other great theme of the day: development (kan-phatthana). The American-built roads that transformed rural Thailand's physical landscape and social and economic systems in the 1950s and 1960s also transformed its people. The infrastructure constructed with American aid, machinery, and advice profoundly altered the relationship between the people of the countryside and those of the urban center. For the first time in Thailand's history, the people and circumstances of the rural areas rivaled those of the capital in importance to the national state. The need for industrial labor, construction workers, and service employees brought waves of internal migrants from what had once been Siam's hinterlands to live and work in Bangkok. The newcomers changed the face of Bangkok, a city whose dynamism had previously been understood to be almost the exclusive product of the Chinese immigrant and entrepreneurial energies. And in doing so they changed Bangkok's self-image. These upcountry people redefined what it meant to be Thai. Their migration patterns from rural to urban were not one-way journeys. Their ties to their homes and the seasonal nature of the farms they left behind contributed to the exchange between two formerly antithetical geographic cultures. The newly mobile brought back the ambitions, ideas, and perspectives of the capital city. These men and women became a migratory population whose outlook was simultaneously rural and urban, traditional and modern, settled and restless. The Thai volunteer soldiers were products of this age of rural transformation. Changes in national politics, economics, and education were influential agents in the formation of their outlook. Their individual stories describe the profound changes under way in areas where the people had only recently begun to see themselves as belonging to the center, as being truly Thai. This process of transformation coincided with some of the earliest academic studies of Thai regionalism. The experiences of the Thai volunteers complement such studies as Charles Keyes' Isan: Regionalism in Northeastern Thailand. The stories of their youth and young adulthood, of their time before, during, and after their tours of duty in South Vietnam, are the stories of rural Thailand in this era. The rapid expansion of government public schools, and the emphasis on national loyalties over local loyalties, encouraged rural youths of this era to consider themselves subjects of the state to an unprecedented degree. Although they were not the first generation to be educated in Thailand's government schools, the volunteer soldiers were the first to have been schooled at a time when secondary education was a possibility for all children of the rural poor. The expansion of upcountry secondary schools and technical colleges provided some of these people with the educational infrastructure for more advanced degrees and also the broadened ambitions and expectations that come with higher learning. Similarly, the traditional intrusions of the state, obligations such as taxes and conscription, were less odious, if not less onerous, to a young population that saw its adult fate as entwined with that of the nation. As per the requirements of the Royal Thai Army's guidelines for the recruitment of soldiers for South Vietnam, all of the volunteers had graduated from secondary school, a newly possible feat for the rural poor. Many of them had continued their education while serving as draftees in the army. The sheer number of volunteers who qualified for service in South Vietnam was a reflection of the rise in education levels throughout the country. As young adults, many of these men had wanted to elevate their social status but had failed so far. Most of them had missed out on the opportunities available to the expanding middle class located almost exclusively in Bangkok's urban sphere. Unwilling to join the unskilled labor force in the capital, they pinned their hopes on gaining positions as civil servants—bureaucrats, policemen, and teachers—in the upcountry provinces of their births. Lacking the advanced education to become teachers and the connections needed to secure a spot in the provincial government, these young men became soldiers. Even this avenue was only a stopgap measure. Like the civil service, the Royal Thai Army lacked the capacity to absorb all of those who sought long-term careers. With the exception of the few who had made a career in the military, most soldiers served only two years as conscripts. The opportunity to reenlist with the Queen's Cobra Regiment and the Black Panther Division represented an unexpected second chance at an army career. The strong desire the volunteer soldiers expressed to visit foreign lands and learn about neighboring cultures reflected a correlated elevation in ambitions as well. The largely rural population of young who volunteered for service in South Vietnam had taken the government's mantra of kan-phatthana and applied it to themselves. A tour of duty as a member of the celebrated volunteer corps confirmed their personal worth as well as their value to the state. Going to South Vietnam became a major goal in their personal program of change. To this day, many veterans cite their time in South Vietnam as the pinnacle moment in this process of transformation. Long after they returned home, and long after they had spent the monetary rewards they had acquired as compensation, the lingering aura of exceptionality garnered them a measure of distinction, of a special social status, in the societies that had produced them. Many got jobs that were better than they would have previously expected. And, a generation later, their children enjoyed even better lives, thanks to the continued financial, educational, and health benefits and expanded horizons that Vietnam service provided. The Thai volunteers saw themselves as Buddhist warriors. Theravada Buddhism—especially the layman's expression of Buddhist culture popular in Thailand in the 1960s—played a critical role in the lives of these soldiers and in the national adventure that sent them to South Vietnam. Thailand's sangha (Buddhist ecclesiastical order), after some deliberation, sanctioned their military mission. The Supreme Patriarch and other prominent monks blessed the departing troops and the returning casualties in public ceremonies. The military units transported Buddha icons along with their weapons and support equipment. A crowded Buddhist altar dominated by a Sukhothai-style Buddha statue was set up in the Thai contingent's field headquarters as the backdrop to all meetings with the Thais' "Free World" allies. Some troops put Buddha images on their military vehicles. And the most emblematic symbol of the Thai fighting man was the string of Buddhist amulets that ringed his head and filled his pockets. Some soldiers brought as many as 100 tiny Buddha statuettes—enough to field a full combat company—for their protection. These iconic symbols would impress their American GI counterparts, facilitate their illicit trading schemes, and neutralize foreign magic in the spirit-rich forests of Bien Hoa. I blogged earlier about South Korean attitudes toward the Vietnam War. A few weeks ago, I came across a food item in my local Japanese grocery store that was new to me. 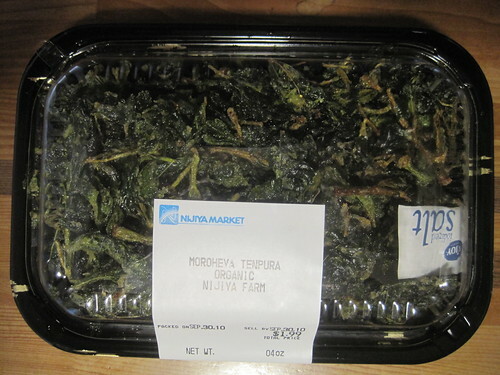 The package of deep-fried, dark green leaves was labeled "moroheya tenpura." Of course, I couldn't resist trying some. The leaves were crispy and oily, stuck together by their own slime, rather than by tempura batter. They tasted oily, slightly bitter—and very healthy! The Japanese name for the leaves is usually written in katakana as モロヘイヤ moroheiya, ultimately from Arabic muluxīya but probably via some non-Arabic intermediary language with /o/ in place of /u/. The leaves of jute plants (Corchorus spp. ), also known as mallow leaves, are widely eaten wherever jute is grown between West Africa and South Asia, and there are many different transliterations of its name in local varieties of Arabic: mulukhiyah, molokhia, mulukhiyya, malukhiyah, mloukhiya. It now shows up in Japanese cuisine, where it's valued for its healthy slimy quality as well as high vitamin content. The Japanese name for the plant (Corchorus olitorius) is shima-tsuna-so (縞綱麻 'stripe-rope-hemp'), also called タイワンツナソ Taiwan tsunaso 'Taiwan rope plant/hemp', ナガミツナソ nagami tsunaso (possibly) 'long-body rope plant/hemp', or simply ジュート juuto 'jute'. In Nagoya this past summer, we made a return visit to the exquisite Kyoukamo Restaurant (京加茂), famous thereabouts for its Kyoto-style kaiseki cuisine. You can see photos of what we ate and drank starting here. Our affable hosts served two award-winning sakes this year, both in the West (Kansai and western Japan) division, where they were ranked like sumo rikishi. The first won the Ōzeki ('champion') prize and the second won the Yokozuna ('grand champion') prize. The latter had such a floral/herbal nose that it resembled an Alsatian Gewürtztraminer. When I asked our hostess for the name of the sake, she said, Henohenomoheji. I asked, "What is that supposed to mean?!" So she showed me the magazine page reproduced here, where the hiragana characters of the name sketch a human face beneath a triangular hat. Each への pair forms an eyebrow and eye, the も forms a nose, へforms downturned lips, and じ delineates the cheeks and chin. 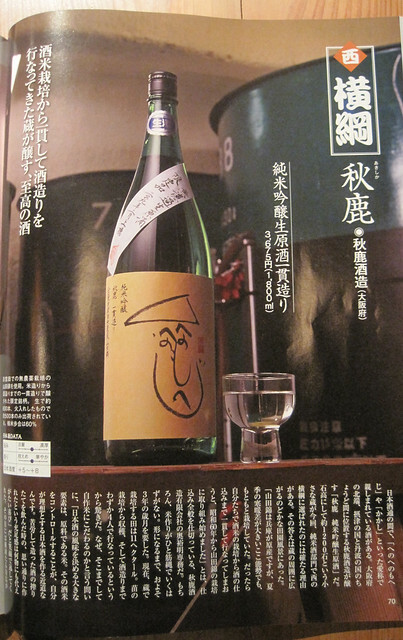 The brewery is Akishika (秋鹿 'Autumn Deer') of Nose Township, Toyono County, where Osaka Prefecture intrudes between Kyoto and Hyogo prefectures. The restaurant owner gave me their address and I decided on a whim to pay the brewer a visit on the last day of our trip, when I had a day to kill on my own and a still-valid JR railpass. Well, it turned out to be well off the JR lines. I hopped a bullet train to Shin-Osaka, took an express to JR Amagasaki, took the JR Fukuchiyama Line uphill to Kawanishi-Ikeda, then walked over to Kawanishi-Noseguchi, the downhill terminus of the little Nose Dentetsu (owned by Hankyu Railway), where a lady at the ticket window said I would have to take a bus from the rail terminus at Myōkenguchi. Myōkenguchi, the entrance to Mount Myōken (妙見山), consisted of little more than a parking lot, a post office, and a combination restaurant and souvenir shop. A bus was due to arrive soon, but it would take 30 minutes to get to the brewery and only ran once an hour. So, as a trophy for my misbegotten adventure, I bought a big bottle of Akishika-brand sake from the very friendly shop owners, who threw in a couple of empty バンビカップ 'Bambi cup' glasses as souvenirs, saying they were their bestsellers and not widely available. (I later discovered you can buy them online.) Then I hopped the return train and transferred my way back toward Nagoya, where I left the sake bottle and cups at our hotel's front desk, for them to pass on to the friend who treated us to that wonderful kaiseki dinner at Kyoukamo.